Sentosa Water Park is part of Sentosa Resorts and is located just off the Mumbai-Pune Expressway, around 1 km before Ravet. Most popular during the summer, there are plenty of fun options for people of all ages to enjoy. The pools here are ‘compartmentalized’ – meaning that kids and adults both have their own designated space to enjoy their time in the water. There is a landing pool and a kiddies’ pool that is meant specifically for kids to enjoy time in their floats, with a depth of not more than 2 feet. Others can enjoy the bends and twists of Sentosa’s water slides; get the ‘beach’ experience in their wave pool, enjoy a relaxing swim in the swimming pool, or be a land-lubber and go for a rain-dance instead. Sentosa Water Park also offers swimming costume rentals for ladies and gents (though we strongly recommend that you carry your own), as well as a locker rental facility for your belongings. Sentosa doesn’t allow outside food and drink, but they have vegetarian meal option for the Water Park – starting from INR 200. There is a multi-cuisine restaurant and a fast food outlet on-site as well, so you can also dine there if the veggie options don’t whet your appetite. 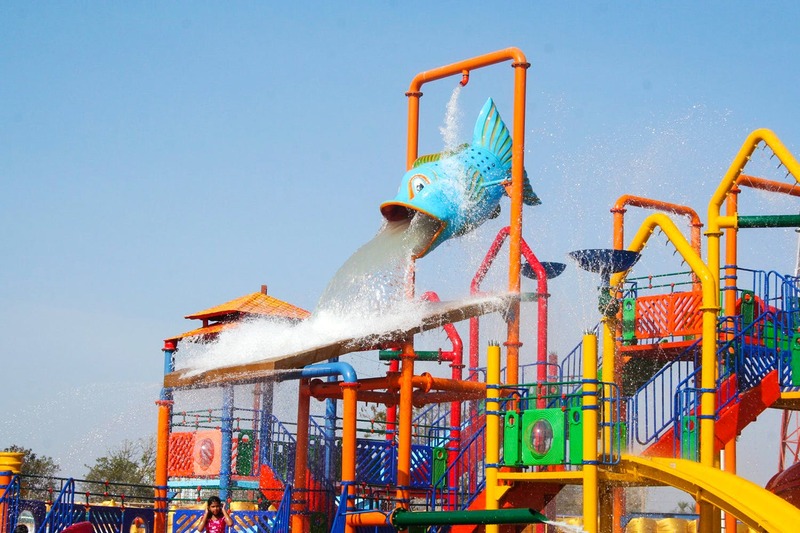 One-day tickets to the Water Park will cost you around INR 400 per head, and you can club it with one of their meal plans to make it a combo. Group discounts can be arranged for, on prior notice. Sentosa Water Park also hosts their own themed events for occasions such as Holi, New Year’s Eve, etc. so keep that in mind! If you’d rather overnight it, Sentosa Resorts also offers their own accommodation in the form of standard or executive rooms, suite-style cottages, and bungalow-villas (latter two categories have access to their own ‘premier lounge’, private swimming pool, and lawn area). For larger parties like weddings, corporate, and other social events – there are banqueting options available on-site as well.